This week as the blogosphere erupted like a school of piranhas around the bloody calf of the American AAdvantage devaluation, I quipped on Twitter that "'Where to credit your paid flights' should be of tertiary interest to travel hackers. Interesting question, but not very lucrative." Primary interest: how much are you paying? Due to the phenomenon I call price compression, how much you pay for your flights has only a glancing connection to the retail price. If you manufacture spend on a US Bank Flexperks Travel Rewards card, you'll enjoy a discount of 62-75% off of retail, depending on where in a redemption band your flight falls. A Citi Prestige credit card gives a 37.5% discount off ThankYou point redemptions on paid American flights, which increases to 79% if you're able to manufacture spend with a Citi ThankYou Premier card at gas stations. Paying less for your travel may not be your only interest, but it should be a primary interest for the simple reason that the less you pay for your travel, the more of it you can afford! Secondary interest: what are you getting? Of course there's a difference between being frugal and being cheap: what you get for your money matters too, or we'd all be flying in the back of Spirit Airlines planes with our knees pressed against our chests (once — never again!). In my experience, Delta Airlines is the domestic carrier most likely to get me where I'm going on time and in comfort. That doesn't mean I'll go out of my way to book Delta flights, but once price compression levels the differences in fares, Delta is far and away my preferred carrier. Tertiary interest: where should you credit? The reason I call the decision of where to credit paid flights of tertiary interest is that it's difficult to imagine a situation in which it would outweigh the factors of cost and convenience. In other words, there's no reason a travel hacker should pay more for less convenient flights that happen to earn a particular rewards currency. There are two reasons for this. First, redeemable miles are cheap. When you can manufacture spend to earn exactly the number of redeemable miles you need, whenever you need them, miles earned through paid flights should be a rounding error in your overall rewards portfolio. Admittedly, it's a rounding error in your favor, and I'm not suggesting flying without a frequent flyer number attached at all. But if you have an award redemption in mind, it would be strange to count on your revenue flights to earn the needed miles. Second, I'm happy to admit that elite status is valuable. But under most circumstances, it's unpredictably valuable. Here's a real-life example: I'm currently booked in economy on a United award reservation to Europe. I've been occasionally checking for business class award availability, and yesterday it suddenly appeared. For 40,000 more United miles, I can move to a premium cabin on a flight over 10 hours. Good deal! But as a MileagePlus general member, United also wants to charge a $100 change fee for each ticket. As a Premier Silver, I'd pay $50 per ticket, a Premier Gold would pay $25, and Premier Platinum and 1K members would pay nothing. That's real value: not some kind of squishy mental accounting, but cold hard cash that would be left in my pocket due to elite status. The same example shows the problem with counting on elite status to generate big savings: to get predictable value from elite status you would need to know in advance which reservations, booked with which miles, are likely to require changes. If you spread your award reservations around between Alaska, Delta, American, and United, let alone the other transfer partners of your flexible rewards currencies, you will be left paying change fees (or keeping suboptimal reservations) on all the ones you don't earn elite status on. When elite status is the natural byproduct of your travel hacking practice, it's a fine way to stretch the value of your rewards. As a checked-bag enthusiast, I enjoy my Delta SkyMiles Silver Medallion status, which saves me a few hundred dollars a year in checked bag fees. But the less a person flies, the less value they receive from elite benefits. The problem with chasing elite status is not that there's anything wrong with elite status, but that it's expensive and inconvenient. If you live in a city where two or more airlines battle each other constantly on price and convenience, then it makes sense to pick one with which to run up your elite-qualifying tally. Otherwise, chasing elite status and redeemable miles is playing the airlines' game, not ours. If having too many points in a single program is one kind of problem, both because of the increased exposure to devaluations and the fact that the least valuable point is the one that is never redeemed, then having just a few points in a program is a slightly different kind of problem. The remaining points left in an account, whether "orphaned" there when you moved your earning activity to another program or the "rump" points left after a big redemption, can be difficult to redeem for anything: too few points for a big, valuable redemption and too many points to simply redeem for magazines. Since I redeem my miles and points as aggressively as possible, I'm often faced with this problem of rump points. I thought it might be useful to go through my balances and see what I can get with my current account balances, without earning any additional points. After my windfall back in January, I rebooked a couple of stays and ended up with a rump balance of just over 13,000 Gold Points. This is enough for a single night at a Category 1 property. Club Carlson's Category 1 offers very slim pickings. The Park Inn by Radisson Puerto Varas, in Chile, looks adorable, and there are a few properties in Eastern Europe that seem fine (although I'm not sure the Park Inn Danube, Bratislava, will still be Category 1 after they finish their renovations on September 1, 2016). There are 3 Radisson Blu properties on the list, in Egypt, Turkey, and India. But since none of those options work for me, I'll likely redeem my remaining Club Carlson points for airline miles. As you'd expect, the transfer ratio is terrible, with 2,000 Gold Points transferring to 200 airline miles with their partners. Still, it's clear that I'm much more likely to redeem 1,200 airline miles than 13,000 Gold Points. "FQF," I imagine you asking, "how can you call 55,000 points a rump balance? That sounds like a ton of points!" Well, it's a rump balance because IHG is a terrible program. 55,000 points isn't enough for a single night at one of their top-tier properties. If I were skipping around the world living in PointBreaks properties it would be enough for 11 nights at one of those, but I already pay rent on a perfectly nice apartment, so I'm not keen on moving to Browning, MT, for 11 days. Having said all that, IHG's huge footprint makes it easy to find properties to fill in the little gaps in an itinerary. I currently have a one-night stay booked at the Grand Hyatt New York for $202.27 (as part of my tentative plan to requalify for Hyatt Gold Passport Diamond status). Instead, I'll buy 5,000 IHG Rewards Club points for $40 and stay at the InterContinental New York Times Square, getting 0.3 cents per point, which is slightly below the Hotel Hustle median value for IHG Rewards Club points. Despite having had a Citi / AAdvantage World Elite MasterCard for several years (since they keep waiving the annual fee), I only recently booked my first reduced mileage award. This is how reduced mileage awards work: if you're redeeming miles for a one-way or roundtrip itinerary within the contiguous United States, and your origin or destination is on the list of eligible "destinations," you receive a 2,500- or 3,750-mile discount on the miles required in each direction. The discount is applied immediately over the phone, which is the only way to book these awards, and it can't be combined with the new short haul awards going into effect March 22, 2016, although American promises that "New reduced mileage award levels will be introduced for these shorter flights on April 1st." All of this is just to say that when applying the 3,750-mile discount I'm eligible for, one-way awards to and from eligible cities cost just 8,750 miles. Moreover, since American's co-branded credit cards also offer a 10% mileage rebate on all redemptions (up to 10,000 rebated miles per year), that rebate immediately brings the total cost of such flights down to 7,875 in each direction in economy (19,125 in first class). One interesting possibility with these awards is to use them for hidden city ticketing. Since every American Airlines itinerary from my home airport requires a connection in Charlotte, Chicago, or Dallas, I could theoretically use a reduced mileage award to fly there and simply exit the airport or continue on to a different destination on a different carrier. In any case, I'll likely kill two birds with one stone and transfer 12,000 Club Carlson Gold Points to AAdvantage, leaving me just 633 AAdvantage miles short of a roundtrip reduced mileage award redemption (n.b. actually slightly more than that since the 10% discount is applied only after booking, so I'll actually need 1,508 AAdvantage miles to make the second one-way redemption. The proof of this is left as an exercise for the reader). I requested a status match to Alaska Airlines MVP status, and received MVP Gold 75K status, valid through 2015. Until the end of 2014 I continued to credit my paid Delta travel to Skymiles, and reached Silver elite status for 2015. For award flights on Delta, and paid flights where I know I'll have to check bags, I'll continue to enter my Skymiles number in order to check a bag for free. For paid flights on Delta without checked bags, and all paid flights on American, I'll credit my miles flown to Alaska, in the hopes of earning MVP status again for 2016. Since I love flying Delta, and live in the upper Midwest, until this year I only rarely had any reason to stray. Now that Alaska has gutted mileage earning on paid Delta flights, however, I'm looking at more American flights. After all, a 1,000 mile Delta ticket in an "L" fare class will earn just 500 Mileage Plan miles (1,125 after the MVP Gold 75K 125% mileage bonus), while the same flight on American will earn 2,250 miles. The farther the distance traveled, the more valuable an economy ticket on American is, compared to the same distance flown in a cheap Delta fare bucket. But American's website is a terrible place to buy American Airlines tickets! In other words, on the one-way flight I searched for, you can prepay your checked bag fee and pay an extra $4 for Group 1 boarding priority. I get free checked bags through my Alaska status, and priority boarding isn't a big deal for me, but many people seem to love boarding early, so maybe it'll makes sense for them. On the flight I looked at, for $80 you can get all the benefits of Choice Essential, plus a 50% AAdvantage mile bonus and free same-day travel changes. 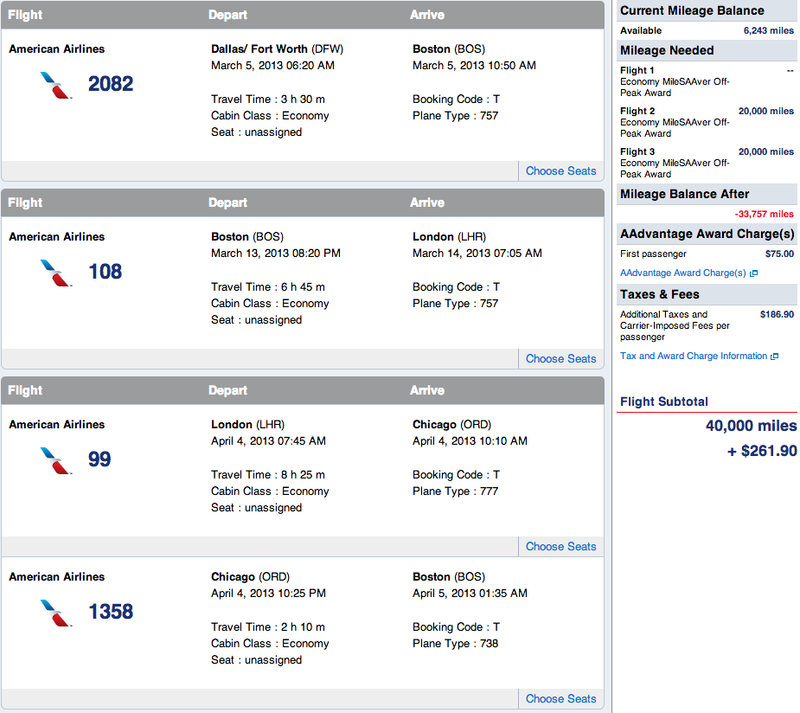 Paying $51 for 1083 AAdvantage miles is not a good deal. 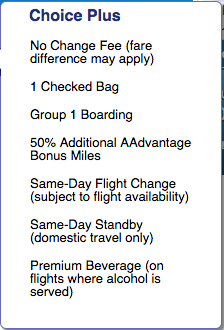 But if you anticipated making same day travel changes anyway, the bonus AAdvantage miles would be a nice touch. The problem is that to earn them, you'd need to travel under your AAdvantage member number, instead of your Alaska Airlines Mileage Plan number, defeating the purpose of flying American to begin with! There are a few reasons why it's good to understand what's going on here. 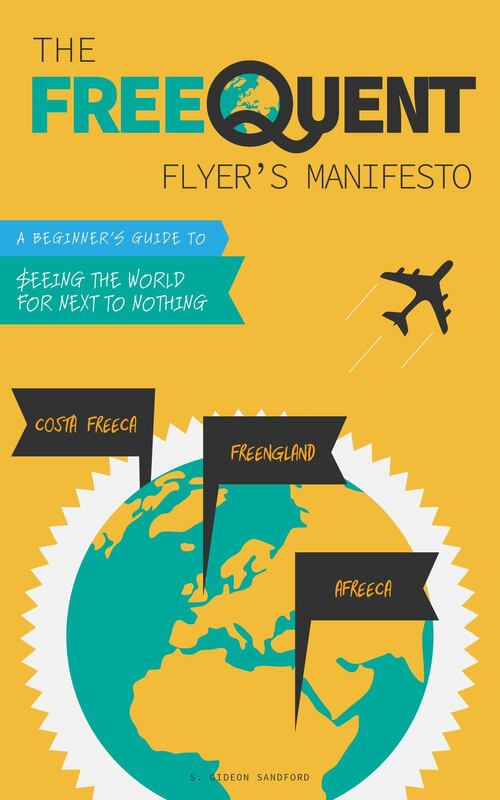 First of all, so you don't unwittingly book one of these Choice Essential or Plus fares! But secondly, you might actually want to book one of these fares, and you definitely don't want to do it through American's website. Since Choice Essential and Plus fares have unique fare basis codes, travel agents should be able to manually book these fares over the phone. For example, when searching the Chase Ultimate Rewards travel portal or US Bank Flexperks travel portal, you won't see these fares since they are all in the same "O" fare bucket. But by calling in to Chase (866-951-6592) or Flexperks (888-229-8864), you should be able to ask the agent to book your ticket into a specific fare basis code, not just fare bucket. It's safe to assume not all phone agents will know how to do this, since it's a bit of an odd request, but if you try a few times you'll hopefully get one who can help you. The obvious reason to do this is if you're planning to credit a flight on American to the AAdvantage program, and the flight you want is towards the bottom of a Flexperks Travel redemption band. By booking your ticket on a more expensive Choice Plus fare basis code, you'll earn the bonus 50% AAdvantage miles, without spending any more Flexpoints. 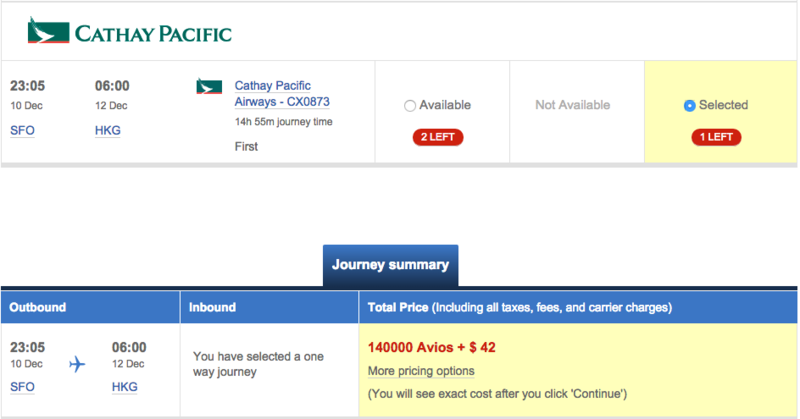 Choice Essential and Plus fares are overpriced, and strike me as a fairly shameless cash grab by American. But that doesn't mean there aren't situations when we can use them to squeeze a few more cheap miles out of the airline. The benefits seem to be primarily for passengers who credit their miles to AAdvantage (and don't have elite status), so I doubt I'll personally be taking advantage of these fare options.